HELMET (AUS) (Chestnut 2008-Stud Aust. 2012, Ire. 2013). 6 wins-4 at 2-from 1200m to 1600m, A$1,607,300, MRC Caulfield Guineas, Gr.1, ATC Champagne S., Gr.1, Sires Produce S., Gr.1, MRC Caulfield Guineas Prelude, Gr.3, ATC Australian Brewery 2YO H., 3d ATC Golden Rose S., Gr.1. Brother to SW Pearls. 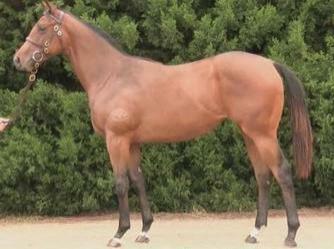 Half-brother to SW Epaulette (ATC Golden Rose S., Gr.1) and SW Bullbars. His oldest progeny are 2YOs. Tarismo - Chromium Alloy (Mac.) (g. by Testa Rossa). Winner at 1200m in 2014-15, 2d ATC TAB Early Quaddie P., Mossman at Vinery H.
RAID (Pins). 5 wins. See above. Lapel. 8 wins from 1050m to 1600m, A$153,135, SAJC Tooheys New H., Renniks Events H., Yalumba H., Recruitco H., 2d SAJC Allan Scott Park Morphettville Flying H., Allan Scott Park Morphettville H., Cleanevent H., Oakbank RC Carlton Draught H., 3d BRC Founding Fathers P., Emporium Hotel H., SAJC Gray Management Group H., Spring Gully H., Tulloch H., Mortgage Force 131497 H.
Panna Cotta. 3 wins at 1200m, 1400m to 2014-15, ARC Auckland Co-Op Taxis H.
STRATUM STAR (Stratum). 4 wins at 1300m, 1400m, A$643,460, to 2015-16, MRC Sir Rupert Clarke S., Gr.1, VRC Yellowglen Vintage S., L, MRC Gothic S., L, 2d MRC Sandown Guineas, Gr.2, MVRC Alister Clark S., Gr.2, VRC Carbine Club S., Gr.3, MRC William Hill P., 3d VRC Australian Guineas, Gr.1, MRC Memsie S., Gr.1, VRC CS Hayes S., Gr.3, MRC Schweppes H.
Serenade (Star Witness). Winner at 2, A$144,750, in 2014-15, ATC Happy Australia Day 2YO H., 3d MVRC Champagne S., Gr.3, ATC Inglis 2YO Classic, L, 4th ATC Magic Night S., Gr.2. Masterful Lad (Masterclass). 10 wins from 1200m to 2850m, A$175,878, Tamworth Cup, AJC Diamond Jubilee H., STC Forest Lodge H., Members' H., 2d MRC Second Wind H., STC Rosie Sun H., 3d Ipswich Cup, Gr.3, AJC Rick Damelion Honda Cup, STC Gaelic Spirit H.
Hamlets Ghost - Jackpot Delight (H.K.) (Danasinga). 7 wins from 1200m to 1600m, NZ$37,425, HK$8,576,250, HKJC Sha Tin Mile Trophy H., ARC Jungle Pocket 3YO H., Matamata RC Boltholder H., HKJC Babington H., 2d Mercedes-Benz Hong Kong Derby, HK-1, HKJC Chairman's Trophy, HK-2, ATV Cup, 3d HKJC Cathay Pacific International Cup Trial, HK-2, Jebsen Centenary Vase, HK-3, ATV Cup H., 4th HKJC Mission Hills Sha Tin Trophy, HK-3. Concur. 8 wins-2 at 2-from 1200m to 2200m, A$136,310, QTC AWA 2YO S., VATC John C Reilly 2YO H., 2d VRC Full On Aces H., VATC Cambria H., AJC Minoru 2YO H., SAJC River Rough H., Domax H., 3d VATC Bond H.
Mission Sealed. 7 wins-1 at 2-from 1000m to 1600m, HK$3,944,598, HKJC Daphne H., Oceania H., Oi Kwan H., Swallow H., Voilet Hill P., Always Win H., Lowenbrau H., 2d HKJC St George's Challenge Cup, Skipness H.
We Wonder. 5 wins from 1600m to 2050m, A$132,123, MVRC Christopher Stear H., MRC Summer Fair H., 2d MRC Sobar H., 3d MRC Samson H., MVRC Don Abell Cup, MRC Morse Code H., 4th MRC Eclipse S., Gr.3. Pinstripe Lane (Pins). 2 wins at 1900m, 2050m, A$226,270, ATC Rexel H., 2d Queensland Derby, Gr.1, BRC Grand Prix S., Gr.3, 3d MVRC Mitchelton Wines Vase, Gr.2, 4th VRC UCI S., L.